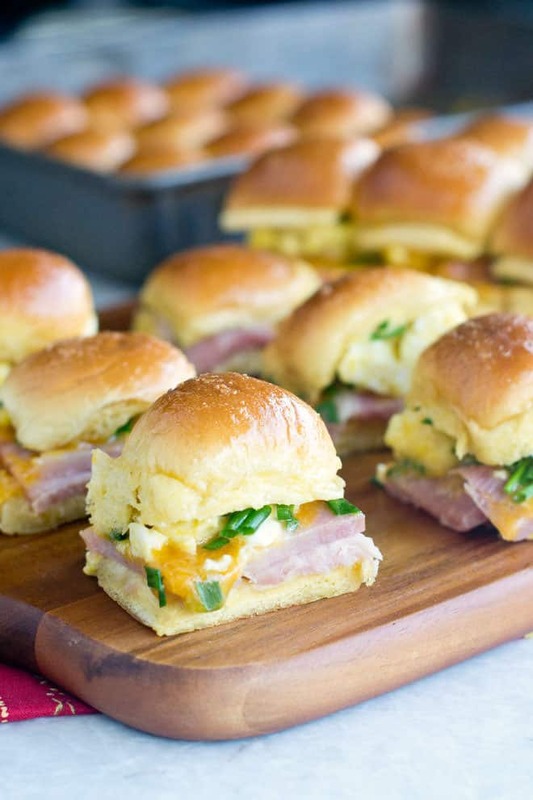 The perfect Easter brunch for a group, these ham, and egg sliders come together really fast and use up some delicious leftover ham. This post is sponsored by Smithfield. I’m going to have a bit of a crowd at my house for the holidays this year, so there will be a lot of cooking and eating going on. I’m not super worried about it though because I have a plan. I’m going to do the same thing I did last time I had a crowd in the house. For the first day, I’m getting a big spiral sliced ham for our entree. 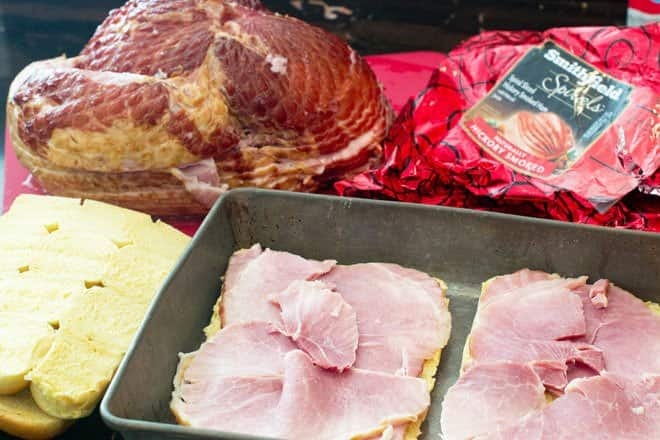 Here’s my recipe for baking ham perfectly. 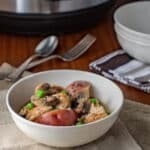 I love to use leftover ham the next day for soups and sandwiches. I always buy dinner rolls that are attached to each other in the bag. I slice them and treat them like one big sandwich, and then slice and serve when my group is ready to dig in. 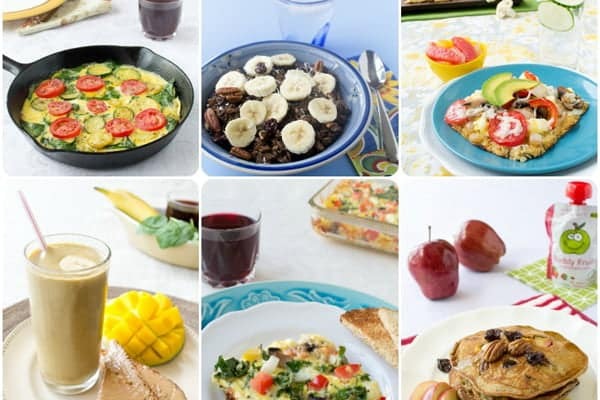 I’m so glad I tried this with eggs and ham for breakfast! I did two flats of 12 buns each to make 24 sliders, which is enough for about 8 people if you have some nice fruit available on the side. 2) Put the two bottom flats of buns side by side in a 13×9-inch pan. Top with some nice juicy slices of Smithfield Spiral Sliced Ham. Two layers of slices is ideal so that you get lots of that meaty ham flavor. 3) Then you add your other toppings. Whatever you’d like, really. I went with some microwaved scrambled eggs, shredded cheddar cheese and chives. 4) Then lay your bun tops over everything, making sure that it is lined up with the bottoms. 5) This next step is really pretty amazing. You make a mixture of melted butter, dijon mustard, garlic powder, and maple syrup and then you pour it over the buns. You want to make sure that all of the bun tops are glistening and shiny (use a brush or your fingers to evenly distribute the butter mixture if needed). The buttery maple glaze is going to cook onto the tops of the buns and make them a bit crisp and delicious. 6) Cover the pan with foil and put it into a 350ºF oven until the sandwiches are heated through and the cheese is melted, about 10 minutes. Take the foil off and keep baking for a few minutes until the tops of the buns get a bit crispy from that butter-maple glaze. 7) Finally, use a couple of spatulas to carefully lift a flat of sliders onto a cutting board. Then use a big sharp knife to cut them into individual buns along the bun seams. See how the ones in the front are cut apart but the ones in the back are still attached to each other? Cool, right? 24 little sliders with very little effort on your part. You certainly don’t have to make each individual sandwich, which would take forever. This way you get all these little sandwiches for a crowd with very little fussing. Enjoy! 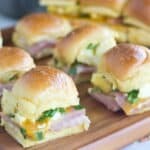 The perfect Easter brunch for a group, these ham, and egg sliders come together really fast and use up some delicious leftover ham. Crack the eggs into a medium microwave-safe bowl. Add the water and whisk until well-mixed. Stir in the chives. Microwave on high for one minute. Stir. Microwave for 30 seconds at a time until set, stirring well between each session. Stir really well, mashing with a fork so that the eggs pieces are quite small. Meanwhile, use a long serrated knife to slice through a flat of rolls lengthwise, such that you end up with a bottom flat and a top flat. Repeat with the other flat of rolls. 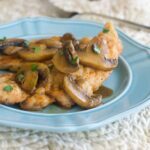 Put the bottom flats side by side in a 9×13″ pan. 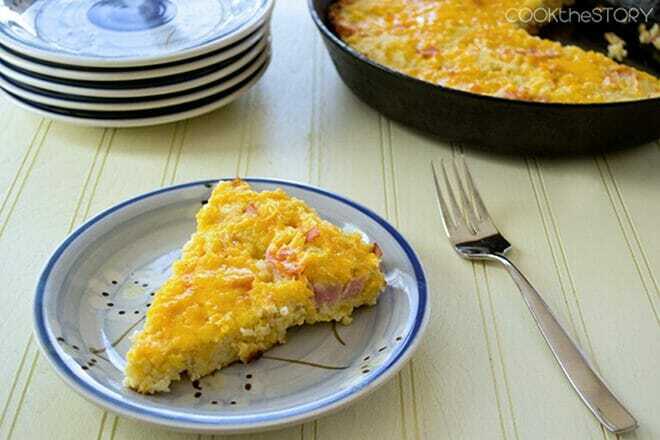 Top each with the ham, divided evenly into smooth layers. Sprinkle with the cheese. Top with the scrambled egg. Add the top flats, cut side down, lining each one up with its bottom. Put the butter, maple syrup, Dijon and garlic powder into a medium bowl. Whisk until the mustard is well-incorporated into the butter. Drizzle it over the rolls making sure that the top of each bun gets a bit. Use a brush or your fingers to spread the butter mixture around so that all the buns are evenly coated. Cover the pan with foil and bake until the sandwiches are heated through and the cheese is melted, about 10 minutes. Uncover and bake until the tops of the buns are crisp when you tap on them, 2-3 minutes. 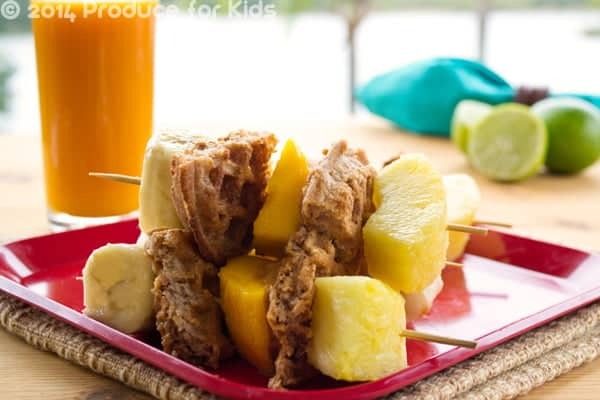 Use two large spatulas to get under a flat of rolls and transfer it to a cutting board. 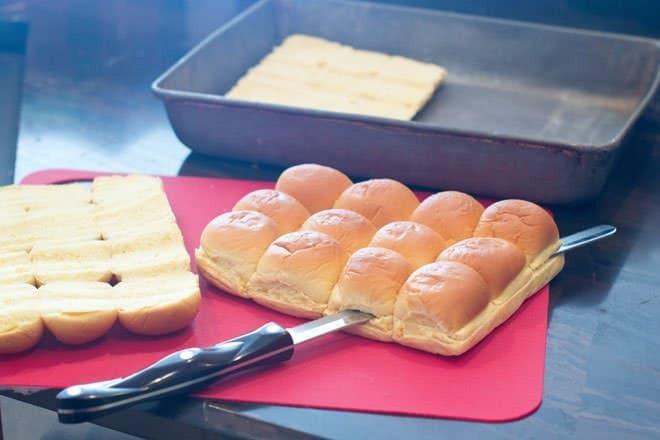 Use a big sharp knife to cut the rolls apart along their perforations, yielding 12 sliders. *These can be made ahead. 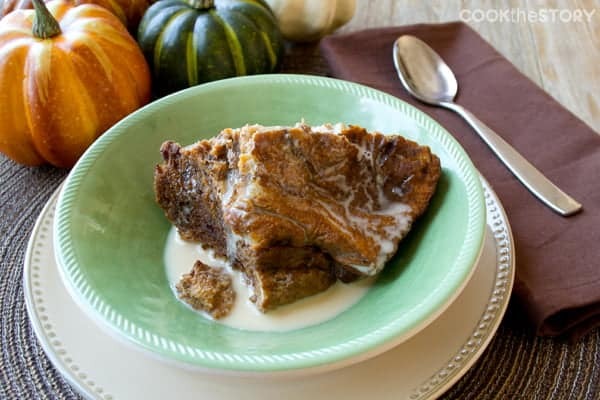 To do so, do steps 2 and 3 and then cover with plastic wrap and refrigerate for up to 24 hours. Then preheat the oven to 350ºF and proceed with steps 4-6. Disclosure: This is a sponsored post written by me on behalf of Smithfield. All opinions are my own. 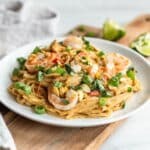 This post was originally published in November 2016 and was revised in April 2019.